This video is not available for purchase in your country. Dynamic friction. 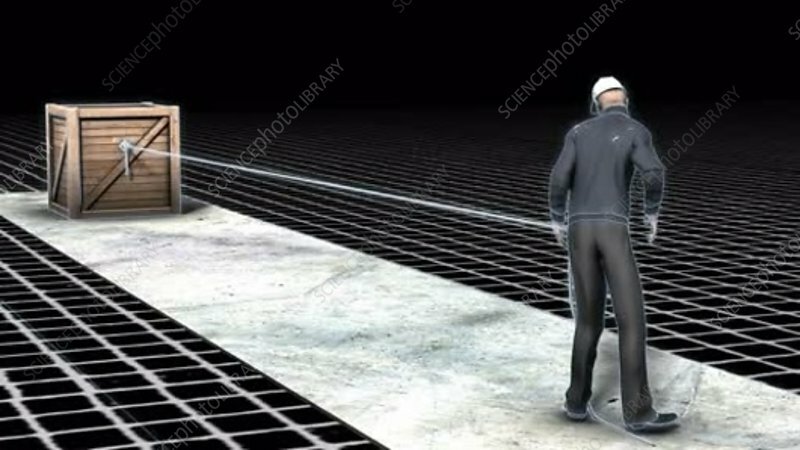 Animation of a man using a rope to pull a crate over rough ground, demonstrating the principle of dynamic friction. Static friction is the force that resists motion between two non-moving surfaces. When one of those surfaces is in motion, a different type of friction applies, known as dynamic friction (also called kinetic friction or sliding friction). Arrows on the animation show that the friction acts in the opposite direction to the pulling force. The animation then zooms in to the base of the crate, showing the microscopic roughness of the two surfaces that gives rise to the friction. Friction was studied by Italian physicist Galileo Galilei (1564-1642).